So we went home and started to make some decisions. We had to decide who we wanted to see, what we wanted. We knew nothing about trisomy 18. It is interesting looking back at what we wrote then. Chris wrote a Facebook post which stated that trisomy 18 is fatal, and I started a Mumsnet thread calling it a 'lethal diagnosis'. 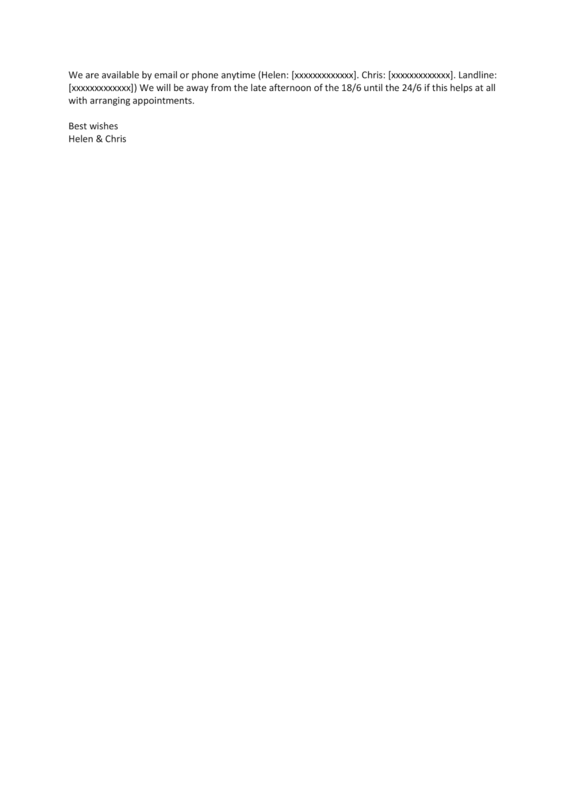 We made a list of people we wanted to see and emailed it to Elysia Crouch. Bereavement midwife to begin to make plans for a possible stillbirth or neonatal death. Cardiology to discuss how the baby's cardiac issues were likely to progress. Neonatology to discuss after-birth care if the baby was born alive. Palliative care team to discuss options, again, if the baby was born alive. Genetics to discuss genetic transmission; to confirm that the baby had full not partial trisomy 18. High risk midwife team to see whether it would be appropriate to transfer care. We decided we would continue with a planned trip to Berlin the following week, but we knew it would be worrying to be far from the UK if we had a stillbirth. 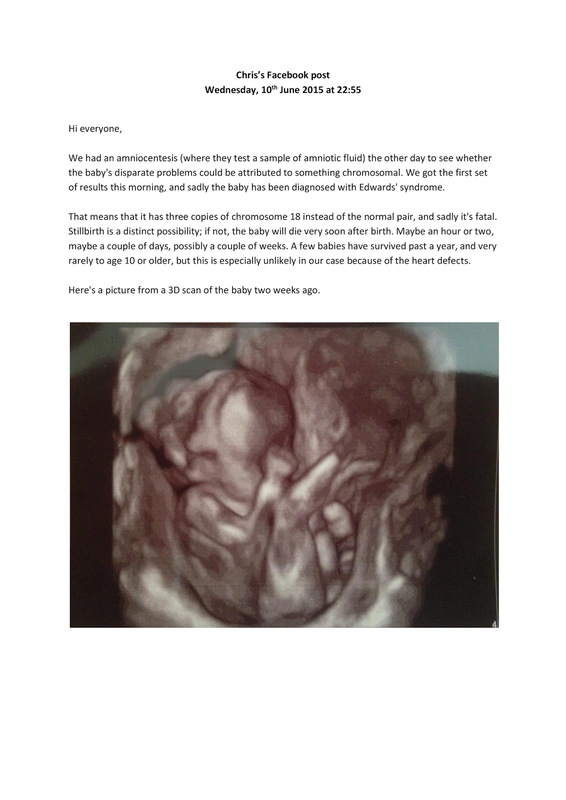 We discussed how we would get back if we couldn't find a fetal heart. Fortunately I had my own sonicaid (also known - confusingly, given that it also refers to an important type of ultrasound measurement that makes use of the same scientific principle - as a 'doppler'). On Sunday, 14th June, we had another appointment with Mollie, our midwife. 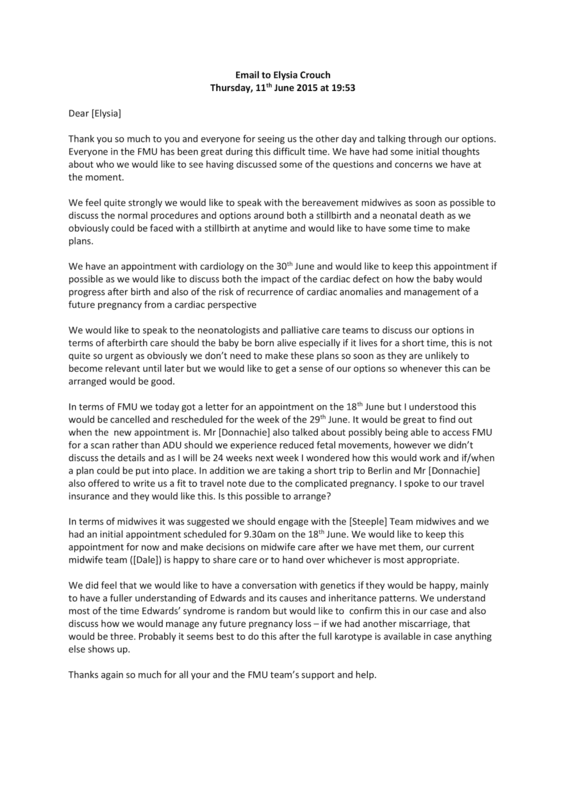 She was supportive and suggested we arrange an appointment with the consultant midwife, Khushi Holloway, who she thought would be able to assist us in making birth plans. At this point we already had an appointment with the bereavement midwife on the Tuesday morning, had arranged for a private 4D scan in the afternoon, and we had an appointment with the high risk midwives - the Steeple team - on the Wednesday morning. We also expressed a wish to Mollie to attend a labour and birth class so that Chris could get up to speed with the basics, as this would help with birth-planning. Plus we were expecting an imminent stillbirth! Mollie called us back on the Monday to say that she'd booked the labour class for the morning on the Wednesday, and the appointment with Khushi Holloway for that afternoon. This meant that on Wednesday we would be spending the whole day in the hospital, getting dinner and then catching the train from Liverpool Street for our trip to Berlin. On Tuesday, 16th June, we headed in in the morning to meet the bereavement midwife, Rosa Deacon. I knew her from my time working in the same hospital previously. We talked about the practical and legal aspects of stillbirth and neonatal death. We discussed arranging undertakers. We discussed burial options. Rosa mentioned home burial and we dismissed it as something people with ancestral land might do. However, even then, I did think, "Hmm, maybe we could." It was a useful meeting. I am glad we had it; it gave us a good basis for exploring all our options. Photos, mementoes, how the induction would work if we lost our baby before birth, could we still have a home birth (Rosa suggested talking to Khushi Holloway about this). We planned to write our stillbirth plan in Berlin. 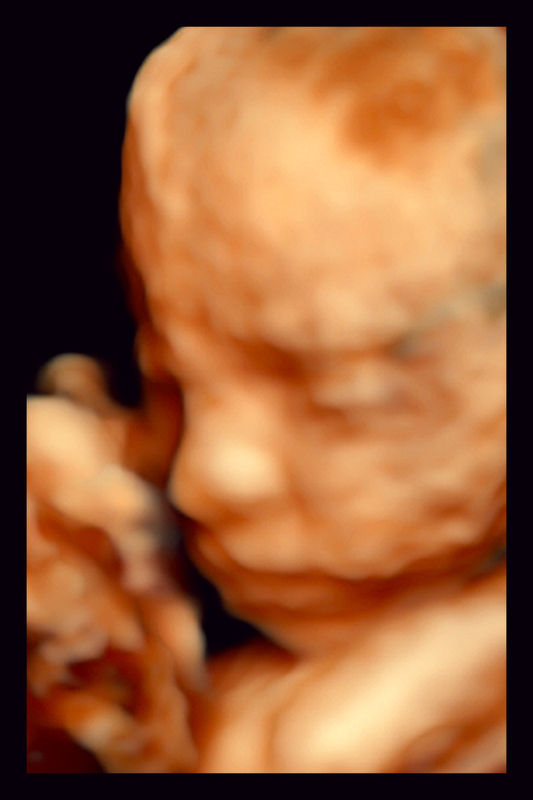 After we had met Rosa, we headed out for lunch and then went for our private 4D scan. It was the same place in which I'd had ovulation scans in pregnancy, and it was the same sonographer I'd had for all of them. She was lovely. 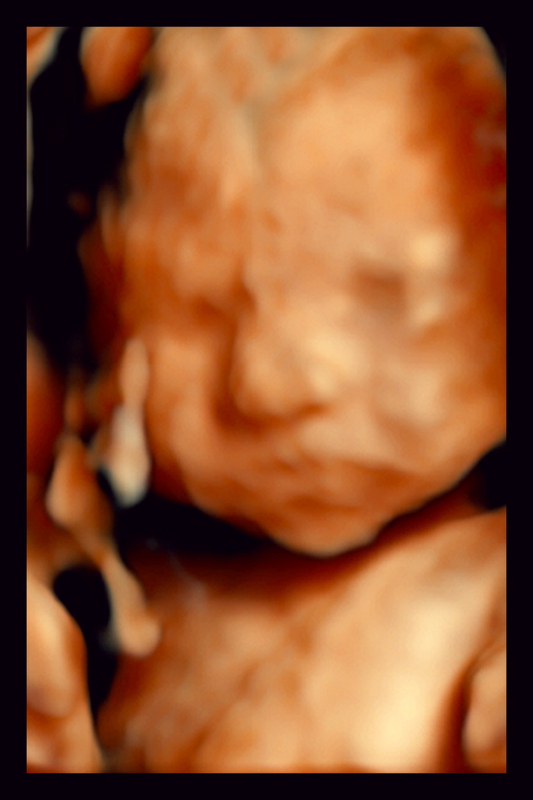 She showed us all our baby's features, and she was able to tell us that she was a girl! We'd thought so, and it was good news, since girls with trisomy 18 do better. We saw her little crossed over fingers. 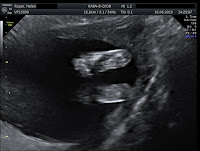 The sonographer thought the rocker bottom feet were not prominent at all, although she wondered if there was a more significant brain anomaly. It was lovely to spend time with our baby, and we got lots of pictures. Though what we'd do with them, who knew? As we left, my CBT counsellor called. I should say that I had been very anxious in pregnancy, and we'd worked on techniques to calm me down, one being to tell myself how unlikely a poor outcome was - and here we were with a very poor one, as I told her now. We planned to regroup in a few weeks to decide whether I should continue CBT. We went home for one quiet day before that long day in the hospital on Thursday and our trip to Berlin!